Sometimes it takes an outsider to see connections which aren’t apparent to those looking from within. Belgian gallerists Dirk and Theun Vonckx, who have selected this show, have their own revealing take on contemporary British art. Over the past months, works by 20th century classics Lucien Freud, Frank Auerbach and Paula Rego have graced the walls of their spaces in Brussels and at De Queeste Kunstkamers in Watou, just south of Dunkirk, near the French border. Quest 21’s current offering of 15 paintings and drawings by Frances Aviva Blane intriguingly brings together aspects of those older, more established British and British-domiciled artists. From Freud and Auerbach she inherits an obsession with oil paint as the substratum of everything. She shares Rego’s unflinching, intensely female sense of psychological confrontation. 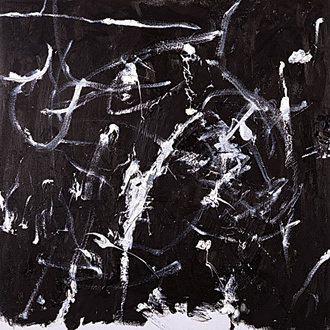 And while Blane’s abstract expressionism draws strength from the artists of the post-war New York school, she has her own austere focus on dark and light, which endows these works with an intensely reflective quality. Her approach is more uncompromising than that of her pictorial forbears – and she makes the leap into the 21st century – the post-9/11 years which have their own political darkness. At Quest 21 the front space overlooks Avenue de Stalingrad Laan and it is here that the grand nearly two-metre square painting called Pitch presents itself as a choppy sea of black. By far the biggest work, it is indeed pitch dark, even the gloss of oil paint is reduced to tones of matt. Blane hurls down the gauntlet: make what you can of this! It’s like going out from a bright room into the night. At first you see nothing, and slowly the points of light appear until you see more and more and realise there is an infinite world out there waiting to be discovered. In the smaller Dark, daubs of yellow, white, blue and red are the positive emerging out of a sea of negativity. But even the darkness has its movements: there is an aching beauty and elegance in the rising touches of black on black – the varying textures and density of pigment reflecting light to create the effect of colour. Exploring light out of darkness and darkness out of light is the continuing theme. In an almost biblical way, but without any pretence, this elemental contrast quite simply and naturally takes us from the immediate visual sensation to an ever deeper emotional and intellectual significance. 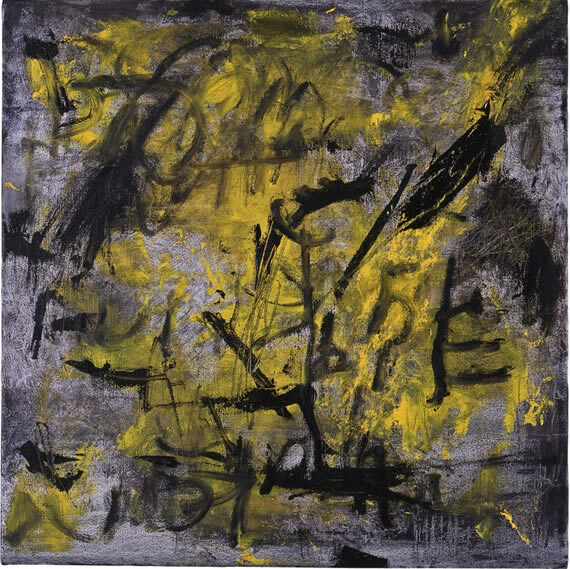 Letter 2 shares the loose abstracted calligraphy of Cy Twombly’s scribblings, like chalk on a blackboard, as though someone has tried to convey a message, but then given up in despair. A white gash streaks across, almost like a meteor. 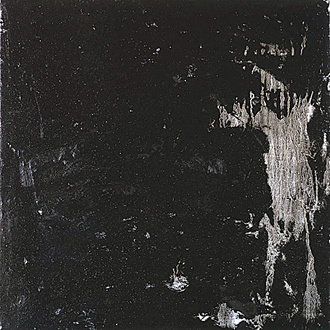 Thick black brushmarks are deliberately left ragged at the edges, so that the white of the canvas becomes a frame. Letter 1 is the opposite way around – black spattered on white, the black drips and flicks occupying the space like dancing black sparks. In Sick the nausea of the title is magically transformed into a snowy landscape of the mind, the thick white impasto creating peaks and valleys enhanced by pinks and reds. We become acutely aware of the sensuous physicality of matter, and simultaneously, to use Bomberg’s phrase, “the spirit in the mass”. Or in more Spinozan terms, “thought as an attribute of substance”. The hang at Quest 21 is inspired in an understated way. 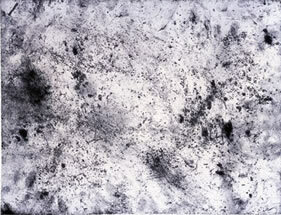 In the central space, a group of four charcoal drawings demonstrates the wonderful variety of Blane’s approach. In one, charcoal slashes move upwards, as though striving toward the light, loosely flung amongst the smudges and finger prints. In another, a dense flurry of tiny dots, almost like dust, is reminiscent of the terrifyingly dense smog generated by the collapse of New York’s Twin Towers. 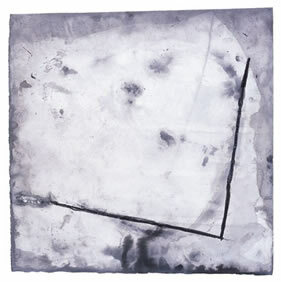 Two canvases, Bird and Mirror, resume the white reversed from black/black reversed from white thematic. Mirror brings to mind the biblical words, so often used, “through a glass darkly”: ghostly white, loosely trailed marks weave across and into a rich black depth. The only strong colour in this show is to be found in Traffic and Beach. In Beach, the frothy, heavily-worked, encrusted whites and creams are, on closer inspection, a torrent of interfering flows, like the foam receding on the seashore, reflecting Blane’s love of the Cornwall and Suffolk coasts. With this body of work, her first solo show since 2006, Blane has held fast to her highly individual approach, often marked by anguish and glimpses into the abyss, a Conradian heart of darkness – perhaps at home in King Leopold’s capital city. But in this outstanding show, there is a new confidence and maturity, an awareness that Blane’s seeming introspection is a window onto not only her own personal highs and lows, but those which characterise our times. Frances Aviva Blane is at Quest 21 gallery, Brussels until 28 September. The accompanying catalogue includes an essay by Monica Petzal.